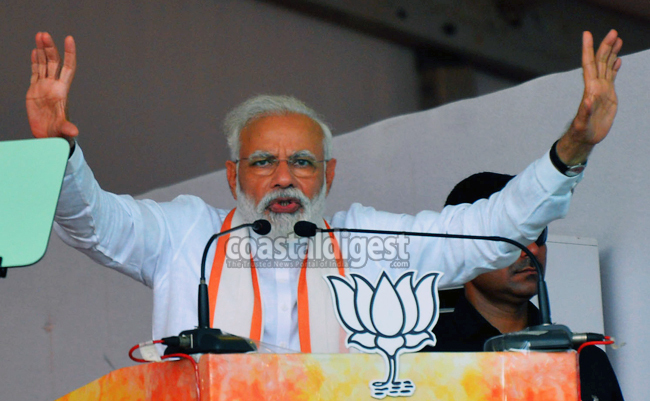 Mangaluru, Apr 13: Prime Minister Narendra Modi Saturday said the Lok Sabha polls was not about choosing the prime minister or a government, but on how "New India" should be in the 21st century. Addressing a massive rally here, he also hit out at the Congress, saying that the country gave it an opportunity in the 20th century, but the party lost it by handing it over to one family. Slamming the Congress-JDS government in Karnataka, Modi said the inspiration for the two ruling coalition partners was "Pariwarvad" (dynasty), but for the BJP it was "Rashtrawad" (nationalism). Modi also described the Congress-JDS government in Karnataka as the "enemy" of farmers, accusing it of having failed to provide a list of beneficiaries for the Centre's scheme to deposit Rs 6,000 a year into farmers' accounts. He also said that the "Mahamilavat" (adulterated) culture of Congress has destroyed not only traditions, but also weakened the Defence and the economy. Yes because of your present 4years terrific effort India so advanced and standing in 25th century. So pls stop feku giri . Patriot Indians please save our Nation India and our Constitution. Jai Hind Jai Karnataka Jai Tulynaad !